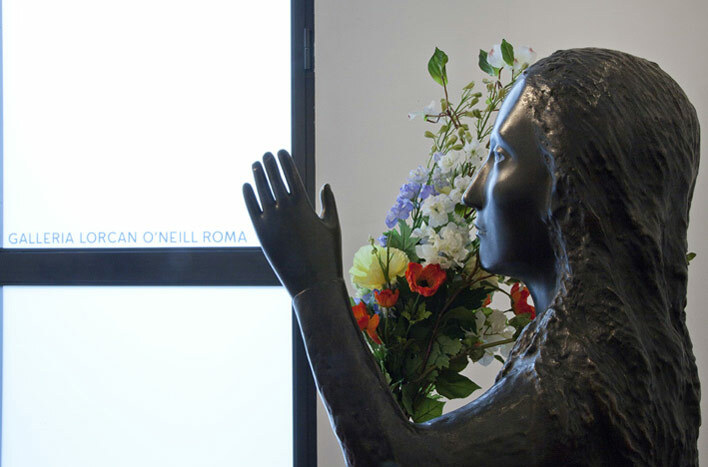 Galleria Lorcan O’Neill Roma is delighted to present Sculpture and Drawings, a new exhibition of the American artist Kiki Smith which opens Thursday 23 September 2010. Kiki Smith is one of the best known artists of her generation. For more than twenty years she has reflected on human existence, the body and creativity. Through images of women and taking inspiration from mythology, religion, anatomy and fairy tales, Kiki creates profound and meditative works which explore the rites of passage in a woman’s life. Religion, mythology, and spirituality surface repeatedly in the art of Kiki Smith. The exhibition will present a variety of work by the artist, including large sculptures, drawings, little porcelain pieces and jewellery. Many pay homage to the nature of the female spirit. In the gallery space are exhibited a number of sculptures. Search is a large sculpture in aluminium, a female figure that gently lets a small bird perch on her hand: a face reaching beyond the autobiographical but with religious echoes. The bird returns in the sculpture Messenger, in aluminium, white gold and gold leaf. Caught for a moment in a trap or perhaps being released from a crisscrossing network of lines, the bird is like a spirit that hovers and illuminates the space and the drawings below, drawings themselves glowing and full of light. The glow returns symbolically in Annunciation, a large sculpture in bronze that dominates the second space of the gallery, on the corner of Via Della Lungara. The sculpture represents an anonymous, seated figure, immobile, with a hand raised in salutation towards the light, spirit or angel that approaches, a work with strong classical references. Also exhibited are a selection of the artist’s new works on Nepalese paper; drawings and collages that echo the images represented in the sculptures. Blue Dress (Mother and Daughters on Bed), is a work on paper that pays homage to maternity. It is a work that recalls ancient royal portraiture, and hints at the brevity of our life on earth. The figures seemingly hover between presence and absence, between the infinity of our life and its brief duration. The artist’s silver jewellery is also exhibited: birds, bats, deer, feathers, planets, buttons and solar systems in little brooches; bracelets of eyes’ irises and suns. Kiki Smith lives and works in New York. Her show in Rome follows on from her recent exhibition in New York at the Brooklyn Museum. Her work is included in important collections in the world, including MoMA in New York, the Centre Pompidou in Paris, the Solomon R. Guggenheim Museum in New York, the Tate in London and the Ho-Am Museum in Seoul. It has been shown in nearly 150 solo exhibitions and has featured in the Venice Biennale (1993) as well as the Whitney Biennial (1991; 1993; 2002).